As a Catholic Family Life Coach I specialize in healing the obstacles to combining faithful living and entrepreneurial success. From motherhood and prayer to exercise and healthy habits it is my mission to help whomever I can ascend this mountain of life while experiencing peace and fulfillment. As a high-level athlete who grew up in a family of faithfully Catholic entrepreneurs, I’ve been gifted the ability to stretch out of my comfort zone and think outside the box. A few years ago, Immaculée Ilibagiza spoke to my heart as she shared her story of suffering and triumph through the power of the rosary with 30,000 other individuals. It just so happened that she was the keynote speaker at a large global essential oil summit I was attending. As she shared, I marveled at her passion and unhindered dedication to sharing the rosary with the world. Here in one moment two of my greatest loves in life were colliding before my eyes - essential oils and the rosary! As I drove across the county I reflected on my personal visit with Immaculee, her powerful gesture of throwing her rosary to someone in the crowd and all I had just learned about the movement of essential oils in health care. My heart overflowed with inspiration and desire to bring to our hurting world the solace and rich blessings of essential oils and the rosary. Thus this effort was born. Our mission is to create beautiful hand crafted rosaries. We seek to create an attitude and an atmosphere of aroma for prayer of the rosary flourish. We seek to help families understand the incarnational meaning of their bodies and the need for health to be a top concern and priority for families today. We seek to dispel myths about essential oils and to help teach families how to safely and prudently and affordably begin using essential oils. With full respect and honor for Our Blessed Mother, we faithful continue the work of introducing and re-introducing the world to her maternal love and her psalter of roses. Together with, good food and movement, supplements, prayer and wholesome habits, essential oils and the rosary can help anyone be the healer in their own home. And this is a noble quest. I am a certified health coach and essential oil advocate. I seek to help others find natural solutions to their physical and emotional pains through the use of essential oils as well as develop a deeper love for prayer and the rosary. 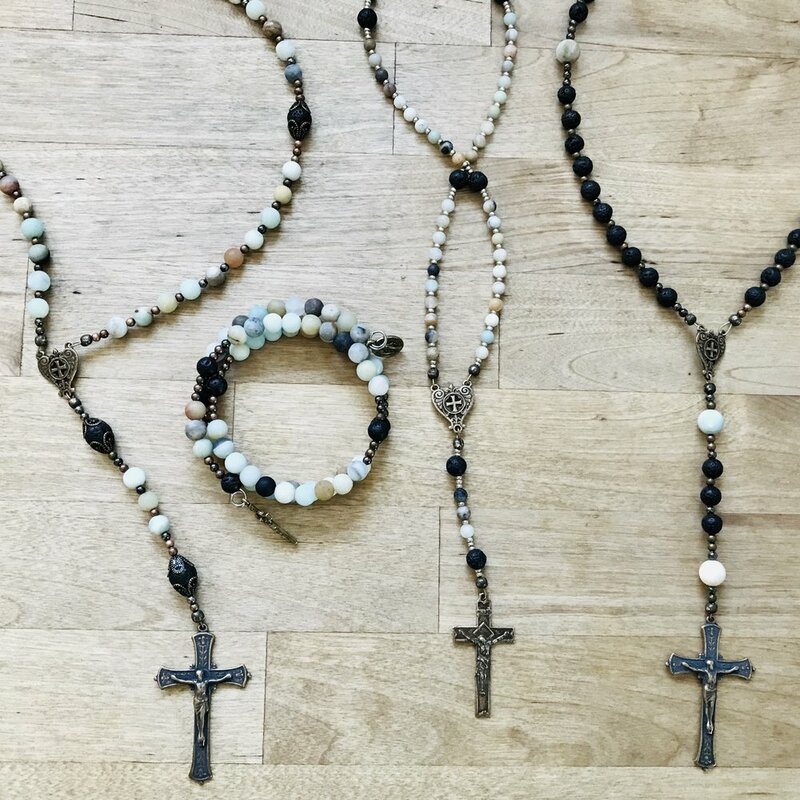 I started this effort after years in the essential oil world in an attempt to help extend the prayer experience for families who desire to enter more fully into the prayer of the rosary and live the virtues it represents. I am excited to help you on your journey of prayer and wellness. Please reach out and share your positive feedback with us. We hope work with in sharing this mission around the globe. It would be more than a joy to help you experience success as well! Are you feeling stuck, anxious, sick, tired, or even just in a funk? I would love to connect with you so we can overcome those obstacles and walk this journey together! we offer online education workshops, ebooks for learning more about the biblical roots of oils and the rosary! Our rosary meditations and media are available as a means to enhance prayer of the rosary. I travel as an inspirational speaking, focusing on a broad range of topics from wellness, personal development, leadership, faith, family, prayer, the Saints and Our Blessed Mother. Last but not least, I we offer essential oil coaching and access to the highest quality essential oils for use in your home and for your health.